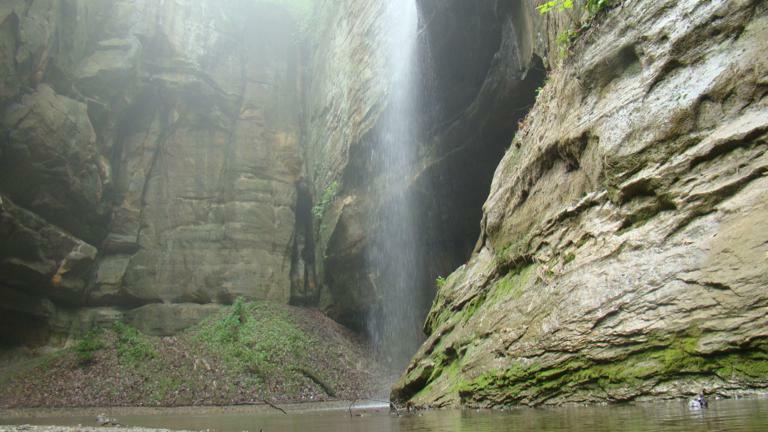 Utica, IL, less than a two-hours drive from DuPage County, is home to Starved Rock State Park. For years, I have heard nothing but good reviews of Starved Rock, yet I had never made the short journey to visit the park. Finally, this past May, I loaded up my backpack and headed for Utica to do some hiking. Utica is to the southwest in relation to DuPage County. Most of the driving directions given have you taking interstates, but I opted to travel IL64 for a more casual, rural route. I recall being a bit disheartened by the rainy weather forecast for that day, but away I went. Utica is roughly an 80-mile drive from Wheaton, IL depending on which route you decide to take. Without once driving on an interstate, the door-to-door drive still took me just under 2 hours. 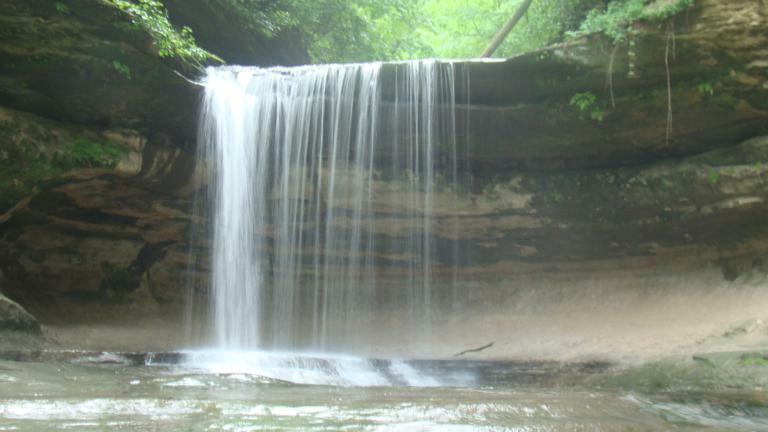 Starved Rock is easily within day-trip range from anywhere in Chicago and the surrounding suburbs. 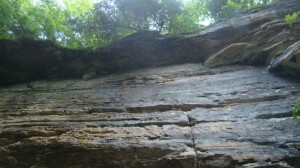 The park’s name, Starved Rock, is based on a passed-down legend. 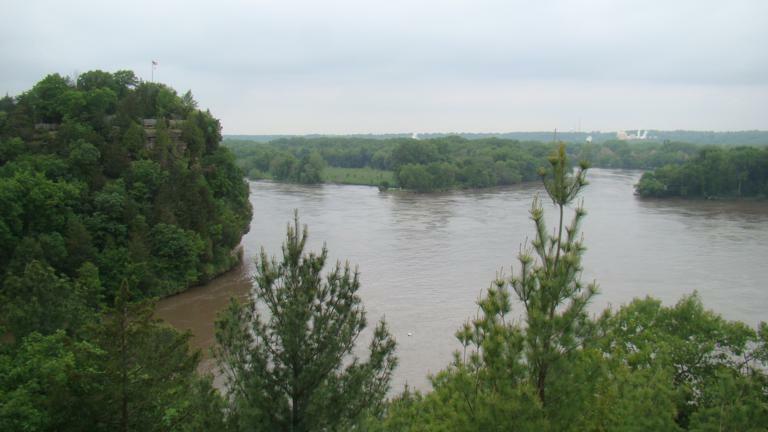 It is said that in the late 1700’s, a tribe of Illini indians were chased to a butte overlooking the Illinois river by Ottawa and Potawatomi indians. The Illini indians are said to have sought refuge upon the butte. It was there on that butte, surrounded by the Ottawa and Potawatomi, that the tribe of Illini are said to have starved to death. I’m not certain of the validity of the legend, but it sounds pretty cool to me. 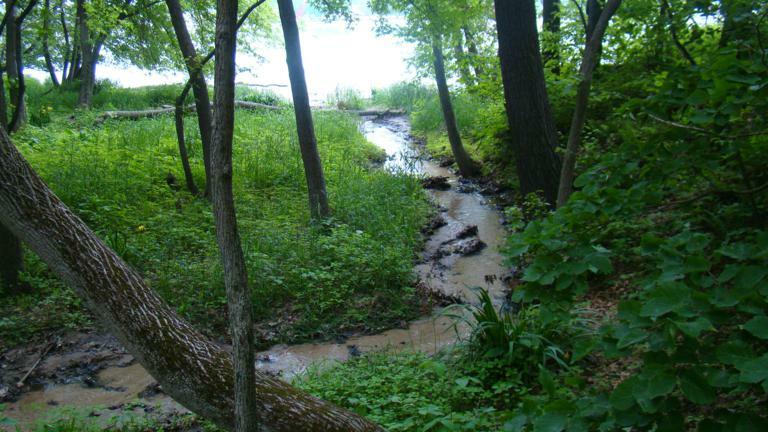 The park occupies a trek of densely wooded land on the southern banks of the Illinois river. The landscape is an abrupt contrast to the seemingly endless miles of Illinois flat lands. The wide, steady-flowing Illinois cuts a vast, ever-present northern border along the length of Starved Rock park. 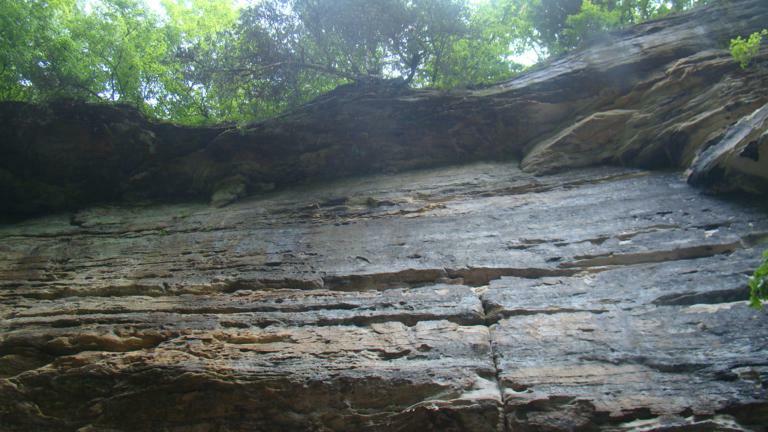 Exposed sandstone cliffs protrude from the treeline high above the banks of the Illinois river, and serve as a reminder that the entire area was once the bottom of a prehistoric ocean. Exposed sandstone cliffs rise high above the banks of the Illinois River at Starved Rock State Park. Once inside the park, I was unable to continue on to the visitor center. The recent heavy rains had flooded out the entire lower parking lot near the banks of the river. I was redirected to the Starved Rock Lodge parking lot, which was already near capacity at 10AM. I parked the car and made my way to the lodge in hopes of finding a trail map. Maps were available in the lodge, but I was surprised that I had to pay $2 to get one (and they’re mediocre hiking maps at best). After studying the map for all of two minutes, I decided I would hike east into the park. After descending down 100-or-so well-maintained steps (no-slip metal steps with railings), I found the main trail-head. Starved Rock (to the left with flagpole) overlooking the Illinois River (photo taken from Lover's Leap). From this point, it is a very short hike to the steps that lead up to Starved Rock, and a little further down, the steps to Lover’s Leap. The trail and terrain, leading up to the steps is about as flat and easy to traverse as can be. However, if you want a to take in the view from above, be prepared to get a workout; there are easily 100 or more steps up to both Staved Rock and Lover’s Leap, but it’s absolutely worth the trip up. Great views of the Illinois River and surrounding area await you at the top. From the Lover’s Leap overlook, I took the trail that lead down to, and followed, the Illinois River. Though trail conditions were a bit messy in spots, due to recent rains, they are clearly well maintained. ** I should note here that it is very important that you stick to the marked trails, especially when on higher ground. 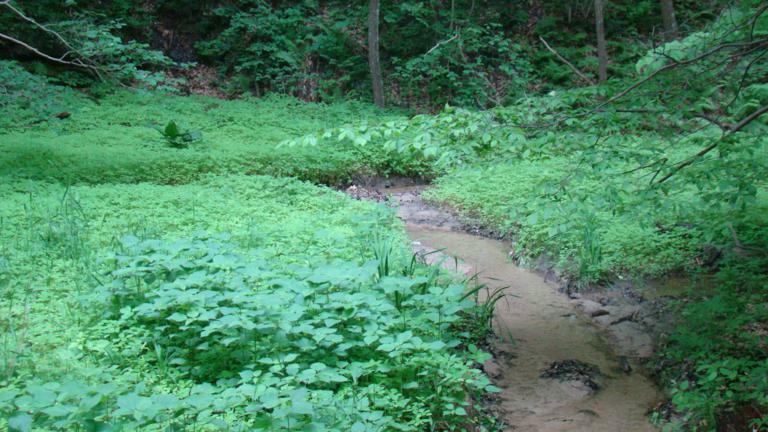 There are some very abrupt drop offs (many of which are hidden by dense vegetation). Do not risk injury or death by exploring where you shouldn’t, careless visitors have lost their lives doing so. Keep a close eye on your children. ** As you hike the trail along the Illinois River, you’ll find deposits of sand washed down from the bluffs during heavy rains. As you travel east along the trail, the river is in nearly constant view to your left. 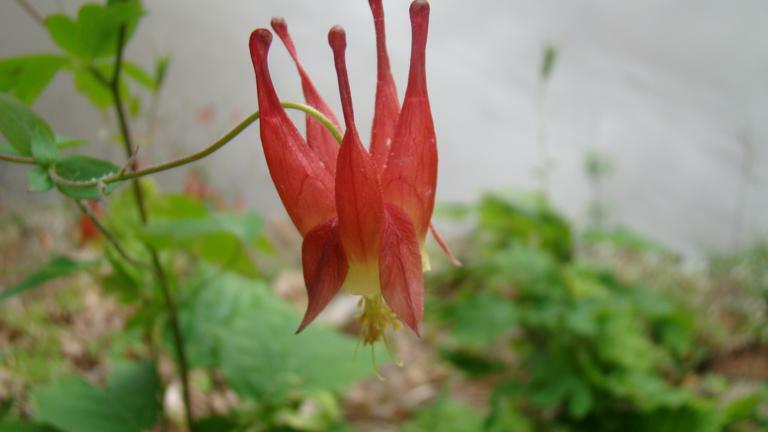 To your right, you will see bluffs and lush green vegetation including numerous wild ferns. 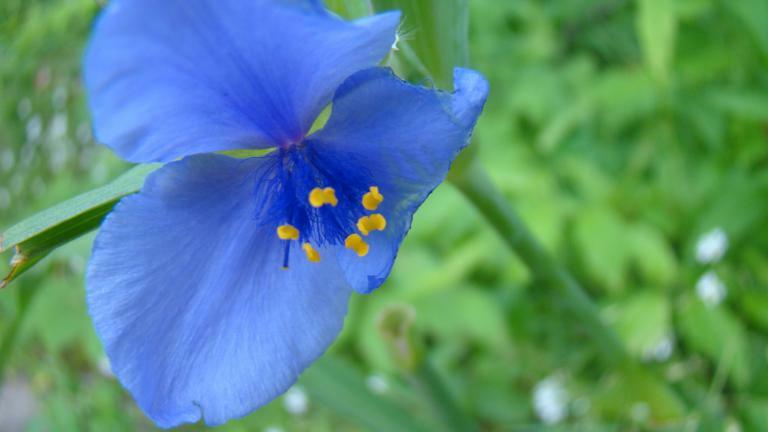 Though I do not know their name, I did see many wildflowers growing along the trail that provided a gorgeous pop of color in contrast to all the green. The trail meanders along, rising and falling somewhat gradually. There is always something interesting to look at. Even with the weather being less-than-desirable, I encountered quite a few hikers along the way. I imagine the park could get quite crowded in fairer weather. I was impressed with how clearly the trails were marked. There are also many points along the trail were you can find maps indicating your current location within the park. Here is a current Staved Rock trail map. 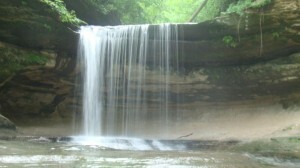 Another bonus to visiting Starved Rock during or after recent rains, is that all of the park’s waterfalls are flowing. There are numerous waterfalls and canyons to explore throughout the park. 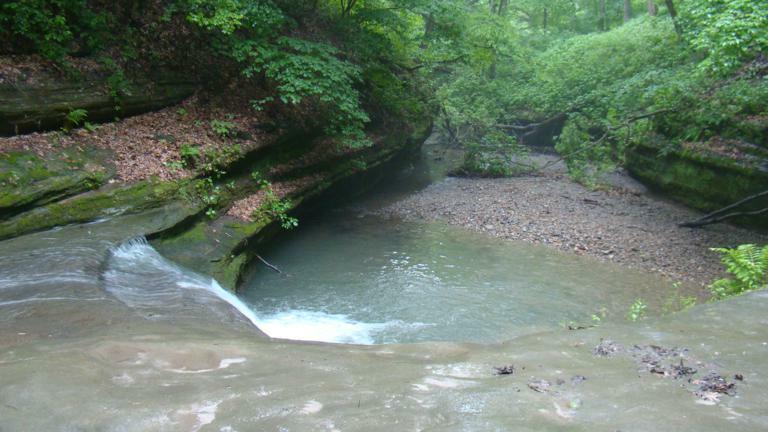 There are caves, streams, and ponds… You will be amazed that there is terrain like this less than two hours from Chicago. I only had one day to hike in Starved Rock, and though I did see a good portion of the park, there is still much more for me to explore on future hikes. If you are looking for to get away, but don’t have a significant amount of time to do so, Starved Rock is an excellent option for a day trip from Chicago. I eagerly recommend that you plan a visit to Staved Rock State Park. There are many nearby camping and lodging options available should you like to make it a weekend getaway.